In this article (and the attached video) I explain exactly how to shoot better…i.e. achieve sub MOA groups. You can read the article or simply sit back and watch the video…it’s up to you. Now…I don’t shoot groups without reason. To establish a precise zero for Long Range Shooting (which is a must). To establish a “baseline” for the weapon platform that I am using. For example, if I know my rifle shoots a given ammo type @ .5MOA and I change ammo for whatever reason, I can assess whether or not the new ammo is better or worse than the previous ammo. So…when I do shoot groups I’m after ABSOLUTE precision and accuracy i.e sub MOA or better and I use these 3 tips/techniques to help me achieve that. It goes without saying that correct application of the Marksmanship Fundamentals is vital. However…most shooters already do this or are aware of the importance of it so I don’t need to go into detail about each step in the process like every other instructor. All I will say is make sure you can apply the fundamentals well and make sure you spend time dry firing. Personally, I take a couple of minutes to dry fire every time I go to the range. It gets me in the right headspace and allows me to relax and be comfortable behind the gun. Ensure you remove parallax from your scope. Parallax occurs when the image in the scope and the reticle are not in the same focal plane. If you take a look at the target through your scope, then move your head left to right or up and down while watching the reticle, and it (the reticle) appears to move…you have parallax and you need to remove it. Simply use the parallax dial on the side of your scope to “dial out” this reticle movement aka parallax. Now…some people think that removing parallax is simply bringing the target into focus. This isn’t the case. Sometimes when parallax is completely removed the target image may no longer be crystal clear. The key here is not to worry about the image clarity. Removing parallax is more important. It also pays to ignore the “range” numbers on the parallax dial. More often than not, to remove parallax completely the amount you dial will not correspond exactly to the target distance. I hate it when I read or watch rifle or ammunition reviews where the reviewers are shooting at those orange 1″ circles…you know the ones! Just think about this for a second…you are at 100y or 100m and looking at this 1″ circle through your scope…now tell me the precise centre of that circle. You can’t can you! It’s not possible. That means that shot to shot there is the possibly that you are not placing the crosshairs dead centre and therefore potentially your point of aim (POA) is slightly different every time you shoot! 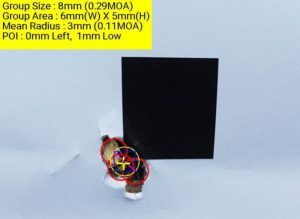 Combine this with failure to remove parallax and/or to practice the fundamentals correctly and its now wonder that folks often struggle to shoot sub MOA despite using a rifle and ammunition combination that is capable of it. Even the ones with lines or Diamonds on them aren’t great (unless you aim at one of the “points” of the diamond – as explained below). This is because the tendency is to align the crosshairs with the lines on the target. If the target isn’t perfectly level, you are now introducing rifle cant into the equation. So…what I do is shoot at a very precise point. For example, I’ll use a 1″ black square or triangle and shoot for one of the corners of the square or one of the points on the triangle. This ensures that on every shot I am placing the reticle on a defined point. Next time you head to the range, implement these three tips and I can almost guarantee that you will see a huge improvement in your ability to shoot sub MOA groups. 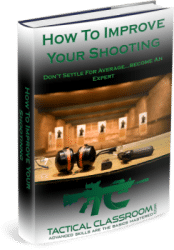 I hope you found this article about how to shoot better helpful. If so, I’d appreciate it if you could share this article. Also…I’d like to hear your thoughts so leave a comment below.